European online video startup, Brainient, whose BrainRolls system enables advertisers to incorporate interactive elements into online video adverts to boost brand engagement and recognition — such as clickable Facebook Like buttons and photo galleries — is tapping into Microsoft’s Xbox Kinect gesture-based controller to push into the connected TV space. Brainient already sells its BrainRolls product for viewing video ads on computers, smartphones and tablets — its system automatically tailors the ad to the type of screen it’s being viewed on, and can therefore offer advertisers the ability to run what is effectively the same campaign across a variety of devices. Today it’s opening a new front with the launch of an interactive video ad that taps up Kinect gestures to extend interactive video ads to connected TVs. Back in August a piece of Google-backed research underlined how people are using a combination of screens to get their digital fix — with connected TVs forming one of the four primary media consumption devices, along with smartphones, tablets and PCs/laptops. Brainient CEO Emi Gal cites this research when asked why the startup is expanding its product to connected TVs now. 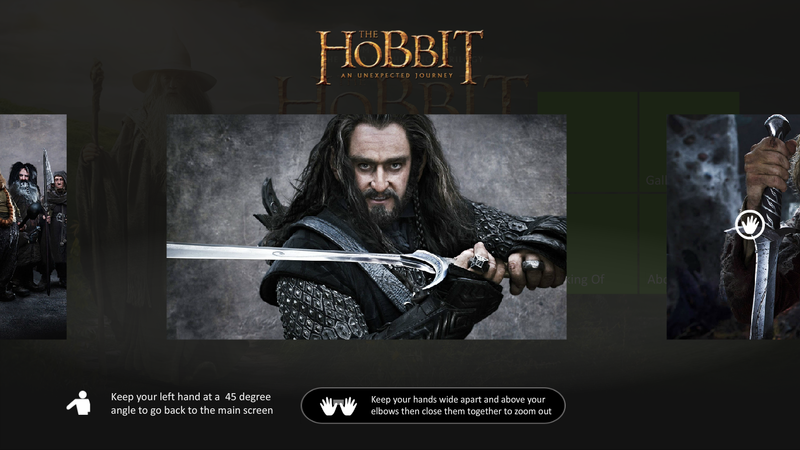 Brainient’s first Kinect-friendly ad is for the forthcoming film The Hobbit. It makes use of the Kinect controller to add interactive elements, allowing viewers to use hand gestures such as swipes and waves to interact with the video advert by, for example, viewing a photo gallery or reading cast biographies. The Hobbit Kinect campaign will appear within some of the apps hosted on Microsoft’s Xbox Live Platform and run for about a month. It is only being screened in the U.K. at present — with the potential to expand it to other geographies or extend its run if it performs well. Supporting connected TVs also puts some clear blue water between Brainient and its competitors, says Gal — such as Sequoia-backed startup Innovid or DG’s EyeWonder. Brainient doesn’t yet have more Kinect campaigns in the pipeline because it’s using this first one as a showcase. “This is the showcase of how it would work, and how it would look like and we’re going to analyse the campaign and build a case study around that,” he notes. Brainient’s business is “growing rapidly”, according to Gal, who says it is currently running between 35 and 50 campaigns per month for media agencies in London — a considerable jump on last year when it ran around 100 campaigns in total. The vast majority of its clients are based in the U.K., although it has run campaigns for clients elsewhere in Europe. At the start of this year the startup raised a £1.8m funding round from investors including Credo Ventures, Atlas Venture and Estag Capital. Existing investors Sherry Coutu and Dave Mclure’s 500 Startups also participated in the investment round. Gal said it’s not yet decided whether it will seek another funding round this year. “We’ve really focused on growing the business and scaling the revenue and the campaigns we run each month and improving our KPIs,” he adds.